A couple of weeks ago, I asked Nora about her babysitter, her husband Carlos' cousin, just trying to get an idea if this was a permanent solution to her babysitter problem or whether she would be leaving again next week. The cousin came to stay with them and is basically 'vacationing' but plans to find her own place eventually. (I assume that means that she will be looking for work, but it wasn't mentioned.) 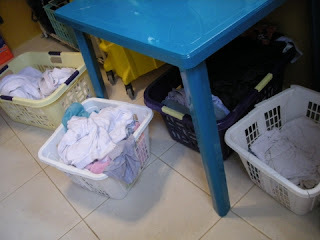 Nora not only cooks for her but also washes the cousin's clothes by hand − somewhere, because they have no running water or electricity in their one room, dirt-floored house that they share with their three children. Nora said, with a kind of 'between me and you' attitude, that the cousin has said that she will babysit the children, but that Nora will have to pay her for babysitting. For example, if Nora works three days a week, the cousin will charge L.100. She said she won't clean or do anything else except prepare dinner the days that Nora comes home late. Okay, L.100 is not much, BUT WTF! I was shocked. What happened to the Hispanic culture of families helping each other out in times of need? What happened to everyone pitching in for the good of the family? Nora told me that the cousin doesn't contribute a centavo to their already more than tight financial situation. Carlos hasn't been working regularly because of the weather and Nora has given me the impression that they have literally gone hungry. Nora certainly looks much skinnier than she did a couple of years ago (when Carlos was working for us) and a couple of her teeth have fallen out even though she's only about 30 years old. Apparently they have burned their credit bridges with the local pulpería (neighborhood food store) because Nora said that if she doesn't have money, they don't get food. They really are in dire straits. I could not help myself and said, "Nora! That's not right. She should at least pay for her own food if you are going to pay her." Nora shrugged and said simply that "Nadie ayuda a nadie" (nobody helps anybody) and that she doesn't make an issue of it because she doesn't want to cause problems with Carlos' family. 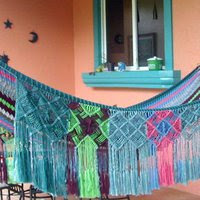 Not only that, she said, but Carlos' brother has been living with them for some long period, something like two years. He usually doesn't work. He doesn't even help around the house. Nora buys his food and cooks it for him and washes his clothes. When Carlos' has enough work with his yard care business, he hires his brother and pays him. The brother keeps that money and doesn't contribute to the family food budget! And, of course, the brother has a cell phone. Whaaaat? No, this can't be. I know El Jefe's family would never be like that. They always help each other. Even when it doesn't look to me like one family member is in a position to be able to help another one, they always pitch in together and find a way. So I asked El Jefe about it. He didn't believe me at first, thinking I must have misunderstood. I assured him that Nora stressed that she HAD to pay the cousin. He said that Nora must have offered to pay her. Nora didn't mention that, but I said that perhaps she had offered, assuming that the girl would say, "Oh, no, you are providing me a place to live and food to eat so of course I wouldn't charge you." No such luck if that was the case. As soon as she has enough, I guarantee you that the cousin will be buying a cell phone. I'm 100% sure of that. I'll be sure to casually ask Nora that in a couple of weeks. I don't think this situation represents a cultural difference. I think it represents a deterioration of the Honduran culture, where the trend seems to be look out for oneself and everyone else be damned. * I'll have to write more about this another time. I happened to notice this cute, very serious little boy selling cheese outside the supermarket. I don't much like Honduran cheese, but he was so low-keyed and not pushy that he caught my attention. I asked what kind it was: queso mojado (wet cheese). Honduran cheeses have such descriptive names − not! There's wet cheese, dry cheese, hard cheese, white cheese, and so forth, giving you no clue as to what the cheese will taste like. All are similar in that they are generally so salty that you can taste nothing else. That, actually, is a good thing, because if you can taste the cheese, it often tastes like spoiled milk. If the cheese has a name that you recognize, like Parmesan, Cheddar, or American − stay away and don't believe it. It is some other-worldly version of what Parmesan, Cheddar or American taste like and thank God they don't. I asked the boy if I could taste the cheese, thinking that if it didn't taste like it was made of spoiled milk, I would buy it for El Jefe. I expected that he would say no, but he put a plastic bag over his hand, tore off a little chunk and handed it to me. Surprise, surprise! It wasn't salty at all and it didn't taste sour. Sold! They were only L.15 (US $0.79) so I bought two. Queso mojado tastes similar to a very fine grained cottage cheese. He then asked me if there was anything else. Confused, I looked around and then realized that his mother (I think) had a table next to him with little bags of corn tortillas so, not wanting to disappoint him, I bought one of those, too. Hondurans do not like to smile for photos. I can usually make them smile, but if I show them both photos, they will always like the serious one the best. Why is that? 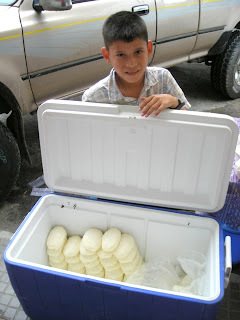 I think I've said in the past that all Honduran cheese is bad, so I will now officially retract that statement and say that if you are at the Paiz store in La Ceiba and see this little boy, his cheese is pretty good. He was also very serious about keeping that lid closed to keep the cheese cold and the flies away, a very good thing. Not an uncommon sight in Honduras. 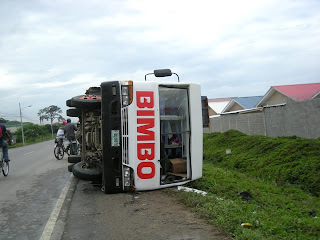 My guess is that the driver was speeding, tried to pass, and lost control when he came head on with another truck. I hope he had on his seatbelt. 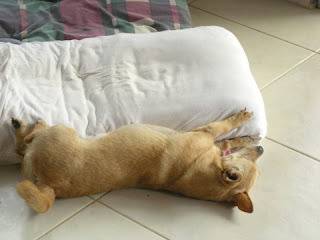 I have a dog so lazy that if she rolls off the pillow upon which she lays 23 hours per day, she will lay on the floor where she falls waiting for someone to pick her up and put her back on the pillow. In this photo, she is yawning, bored from the long wait for someone to pick her up again. El Jefe has spoiled her rotten. She truly believes that she is daddy's little girl and shouldn't be subject to all the stuff all the other (boy) dogs are. 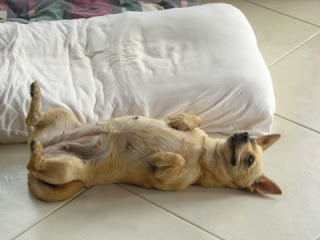 Where did that expression "work like a dog" come from? We had a really nice day yesterday! We took a little trip to San Pedro Sula to check out the after Christmas sales and to try once again to look for furniture for our sala principal (living room). San Pedro is about 110 miles from our house and the trip usually takes about 2 to 2 1/2 hours, depending upon how many times we stop. El Jefe informed me we were NOT stopping for photos or we wouldn't get there until the stores closed (since we already had a late start) so I had to settle for video out the passenger window at 60 mph. I have no idea what I'll do with 15 minutes of that video. If I slow it down so you won't be dizzy, I guess it will be about 30 minutes of video and who has the patience for that? I think you might enjoy parts of it, though, as the videos show what the real Honduras looks like so I may try to put together some pieces of it. 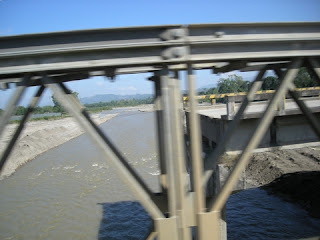 The highway is in amazingly good shape right now, except for one bridge which was out. 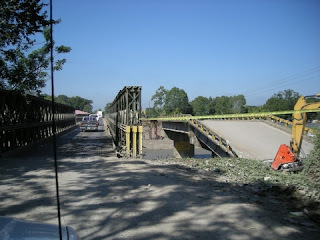 Apparently it fell down and they have built a temporary one lane bridge in the meantime, with traffic directors whose idea of fair is that each side has to wait 15 minutes at a time for their turn. The road was great other than that, a couple of potholes that would probably rip the tire off your car if you didn't see them, and two towns that have a series of killer speed bumps. 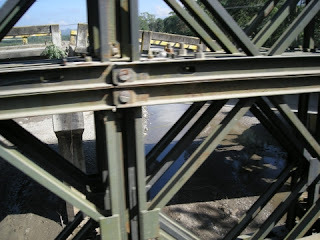 The photos below show the broken bridge if you look past the blurry trellis in the foreground. I never get tired of watching the view along the way. I used to take along something to read but found that I never did read. Sometimes I help with the driving, but usually El Jefe likes to do that himself. First we went to Diunsa which is a nice Target-like store. They have fantastic sales of 30% off EVERYTHING in the store, 40%-50% off some items. Diunsa has some nice quality things, Cuisinart, KitchenAid, Mikasa, for example, and I'm pretty sure every toy in world. 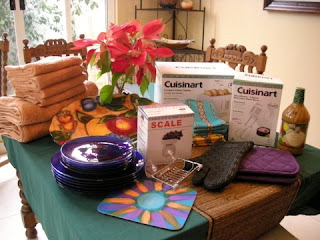 El Jefe made the mistake of leaving me alone in Diunsa (He knows about my kitchen-stuff addiction! It's not MY fault!) while he took care of something else. Most of the stuff in the photo above is from Diunsa. I really don't know how their prices compare with U.S. prices. It may be that the appliances (large and small) are a little more expensive than the U.S. but it is a moot point for us. I saw 4 1/2 quart Kitchen Aid mixers for L.9,200 (US $545 with tax!). Many things seem a bargain, though. The cobalt blue glass plates in the photo hardly cost more than a package of paper plates! We went to Sears looking for lawn mower wheels − no luck there − but I did find some towels that go perfectly with our weirdly colored dusty orange bathroom. I only bought two towels and four hand towels because I wasn't sure if they would match or not. Now I'm itching to go back for more because they look fantastic. If I live to be 100, I'll probably never find more towels, other than white, that work in that bathroom. 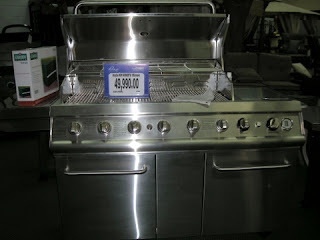 This grill is what El Jefe wanted from Sears! No, he didn't get it. That L.49,990 price in lempiras will definitely give you sticker shock! We went furniture shopping and found some nice stores. Finally, after all these years, we found some furniture for our sala principal. You can't imagine what a thrill that is for us! I've been looking for some casual rattan furniture that wasn't complete weird-styled junk and finally I found it! It's even made in Honduras. I'm so happy and just hope that the orange in the fabrics goes with the orange walls. Why I didn't think to take my paint and tile samples, I have no idea. We also bought two rattan chairs and an ottoman for our bedroom. Again, the problem with picking out a fabric! Jeesh! I know better than that, but I'll be content to recover the cushions if the color doesn't work in our purple (!) bedroom. El Jefe thought everything was too expensive. The prices did seem expensive compared to some of the other stores with more formal, ornate furniture, but that isn't the style that we wanted. I suggested that we could continue looking for another 5 years to see if we found something nice at a better price....so he decided that we should get it. He was able to get the price reduced even more over the already reduced end-of-year price. The furniture won't be delivered for a week or so, so I'll be posting photos later on. I didn't even think to take a photo in the store. I was completely out of blogger-mode yesterday! We also went to PriceSmart to stock up on some things that we can't get here. It was literally minutes before they were closing so I didn't get to pace the whole store like I usually do. We only made it to about half of the stores we wanted to go to. That happens every time we go to San Pedro. 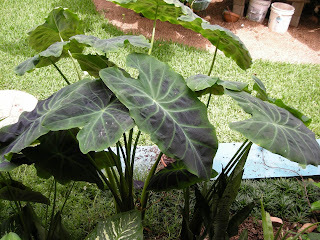 We really need two days there, but with the animals to tend to, we really can't stay overnight. We arrived home after 1 a.m. As we opened the driveway gate, Chloe came happily running out with the newspaper in her mouth! It arrives around 8 a.m., so I guess she was waiting all that time to get her reward! We laughed so hard about that. The chihuahuas were crying because they aren't used to being out-door dogs − daytime is one thing but staying out on a cool night? Sleeping on the cold ceramic tile instead of a fluffy warm pillow? 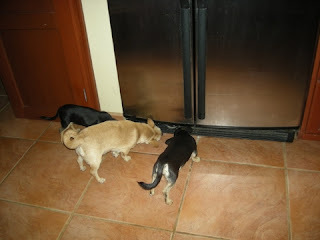 They were appalled to receive such treatment, not to mention that it appeared that Chloe had eaten all of their food as well as her own just to show them that she could. Update, May 2010: It is with great sadness that I report that Play Taty's restaurant has closed. 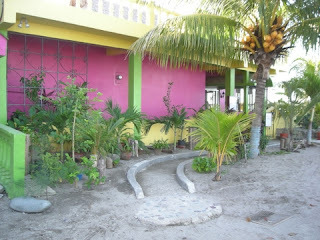 If you ever come to La Ceiba, you MUST eat at Playa Taty's Restaurant! You MUST! I insist. I don't do many restaurant reviews, because there just aren't very many that I can recommend. I'm excited to be able to whole-heartedly recommend this one. 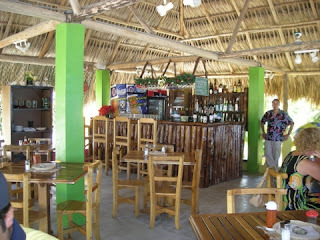 Playa Taty's is a new restaurant on the beach in the Zona Viva. We took our good friend blogger Katrina there for lunch Friday to "celebrate" (really to mourn) her leaving Honduras to return to the U.S. to get on with her life in the real world. Right off the bat before we even entered the restaurant, I was impressed with the new landscaping and the gorgeous bright tropical colors of the restaurant. It just looks like a beach restaurant should look, don't you think? 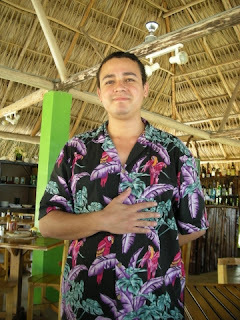 César was our waiter and he was without a doubt the best waiter we've ever had in La Ceiba. Efficient, friendly, and a real charmer. He speaks Spanish and English and didn't give me that deer-in-the-headlights look when I spoke in my Texas-accented Spanish. We'll definitely be looking for César when we go back. The menu includes a variety of seafood, steak, pork, and chicken dishes with a Caribbean flare as well as some New Orleans style offerings. The entrée prices, ranging from around L.165 to L.300 (US $8.75-$15.85), are just a little higher than many La Ceiba restaurants, but still very reasonable. The steak entrées and steak-seafood combos are around L.400 (about US $21) and the lobster dishes are priced de temporada (seasonally). Which would you rather have: a blah meal with poor service at a bargain price or an excellent meal at a fair price? Uh-huh. Me, too. The menu also includes three salads with seven different dressings, soup of the day, three sandwiches, and hamburgers. 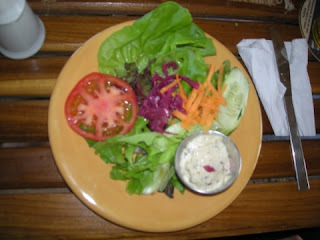 Most of the meal-sized salads and sandwiches cost around L.100 (US $5.29). Daily specials are available, and on Sundays, the restaurant offers prime rib. We were so enthralled with the variety of the menu that we literally spent close to an hour trying to decide what to order. So, struggling between the nine appetizer selections, we finally decided on the coconut shrimp served with charred pineapple cocktail sauce and tempura conch appetizers to tide us over in the meantime. We weren't disappointed. 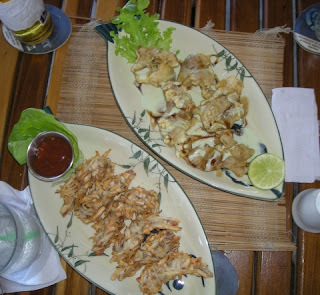 Most of the appetizers are around L.100 (US $5.29), with the shrimp and lobster entradas being higher. Many of the platos fuertes (literally: strong plates; entrées) come with a side dish and salad. 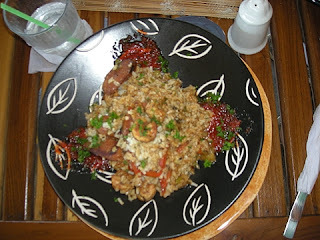 I ordered the shrimp and sausage jambalaya (loaded with shrimp and sausage and SPICE-EEE!) which did not, so I ordered a side salad for the reasonable price of L.40 (U.S. $2.11). This is a real, honest to goodness salad of fresh, crisp, mixed baby lettuce, tomatoes, cucumbers, grated carrots and braised red cabbage with a choice of seven different dressings, none of them that watery mayo-ketchup mix that all La Ceiba restaurants serve. That alone is enough to bring us back. 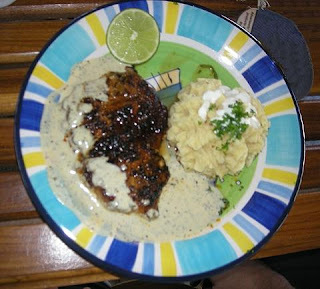 Katrina ordered the grilled conch and El Jefe ordered the grilled grouper with lime cream (photo). Both came with the house salad and yummy garlic mashed potatoes presented beautifully. In the interests of restaurant review investigation, of course I had to test everything that was put on the table, so I can say that it all was mighty tasty. 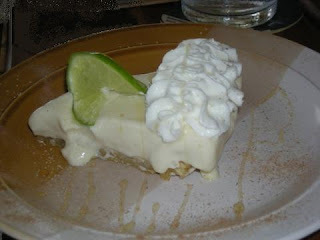 Playa Taty's had six different dessert selections, which is incredible in La Ceiba. The only other place that has that many is Applebee's but Applebee's dessert prices are double or more what these cost at Playa Taty's: L.40 (U.S. $2.11)! 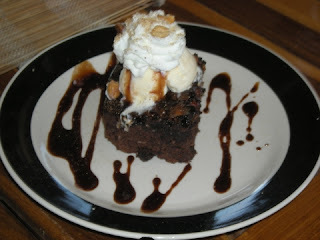 It was a really tough choice, but Katrina had the coconut raisin peanut brownie sundae which included the largest hunk of brownie I've ever seen, El Jefe had the banana rum cake, and I had the island lime pie. They all came topped with fresh whipped cream and all were outstanding. A few things besides the food really pleased me! The waiter was very attentive. 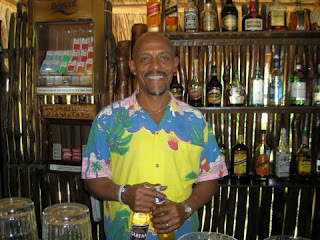 Both the waiter and Vander, the bartender (photo), smiled and were very friendly. (I checked with both of them: sure enough, neither are from La Ceiba! 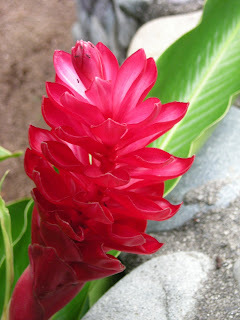 Vander is from the Honduran island of Roatán and César is from Tegucigalpa.) A good waiter adds so much to my enjoyment of a nice restaurant experience. Even the tropical shirts made me smile. We received clean silverware with each course! 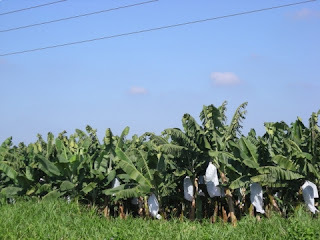 Nothing new in the U.S. but it certainly is in La Ceiba. 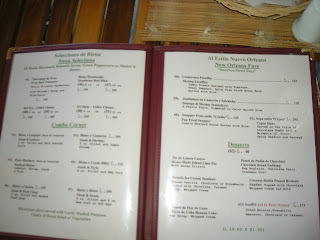 The menu is clear and easy to read (in both Spanish and English). One of my pet peeves is menus with tiny ornate fonts and dark background images which seem to be the rage in many La Ceiba restaurants making them almost impossible to read in a dimly lit restaurant. Not only that, but we never heard "no hay" (there isn't any) a single time. In some La Ceiba restaurants, it is just easier and less disappointing to ask what they have instead of looking at the menu. This may sound silly, but I was really excited about the presentation of the food and the colorful plates. If you could see the usual food presentation in many restaurants and the scratched, chipped and beige (or even throw-away plastic) plates, you'd understand. 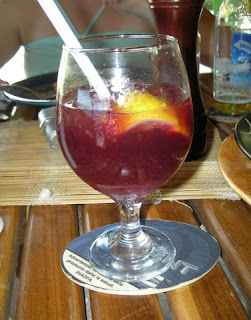 César also offered a complimentary sangria when I was struggling to decide if I could possibly finish off another Piña Colada. I don't know if he thought I was a real restaurant reviewer (because of all the photos and questions) and was trying to please me or if that is common for the big spenders. ;-) In any case, it was a nice and rare gesture! 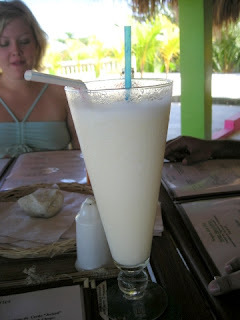 We ended up spending 3 1/2 hours for lunch at Playa Taty's! And we enjoyed every minute of it. Katrina said it was a perfect way to spend her last day in La Ceiba and I couldn't agree more. While I was there, I met the owner and chef, Carl Husbands, to compliment him on the food and especially on the service. He lamented about how hard it is to get good help. I sure hope that he keeps César and Vander happy because they are worth every lempira. 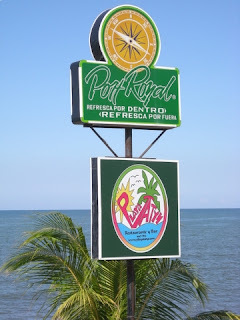 I told him that we enjoyed it so much that I would be recommending Playa Taty's to everyone I know and that I was going to write about it on my blog. 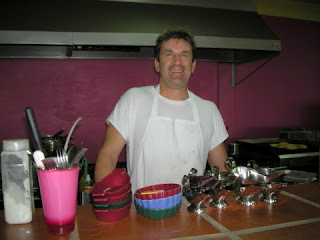 He didn't seem too impressed ;-D, so, please, if you ever go there, tell him that La Gringa sent you! I realize that any good restaurant critic would try a restaurant more than once before recommending it, so El Jefe and I plan to go back often. Who knows? We might go back tomorrow night − it was that good! Try Playa Taty's! You'll be glad you did and please come back to let me know how you liked it in the comment section. Just in case you are wondering: No, we didn't receive a discount, kickback or anything of that sort. I'm just happy to share this new discovery with you. I believe in supporting a so-badly-needed quality restaurant and wish Carl all the best success on his new venture. I'll get back on schedule in a few days, I promise. We'll clean it up for you! I was making ice cream the other night. I always have to chill the mixture in the freezer until it is very, very cold, otherwise it just doesn't freeze in the ice cream maker. No matter how cold the ingredients are to start with, by the time the mix is complete, it isn't cold enough. After chilling it for an hour, I checked and it was ready. I stuck it back in the freezer to wait while I assembled the ice cream maker. Even two minutes sitting on the countertop will rewarm it. 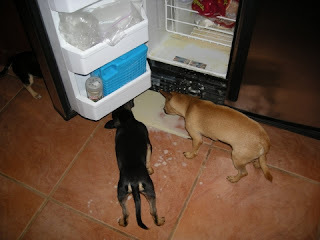 When I opened the freezer door again, ice cream started pouring out on the floor. The container had tipped over and my nicely chilled ice cream mix was all over the bottom of the freezer and dripping out on the floor. I try not to cry over spilled milk, but spilled ice cream? Whaaaa! Not to worry! 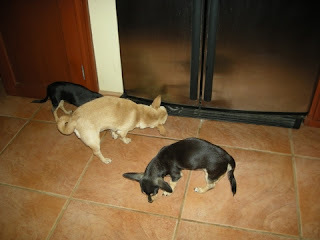 My clean up crew rushed in to take care of the job. 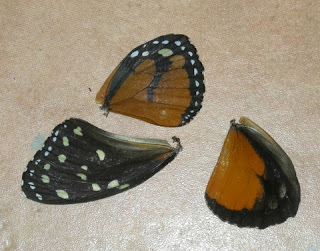 The little ones couldn't quite handle it so I brought in Chloe to finish the job and finish the job, she did. That floor was spotless and dry as a bone. Oh, you are still here? 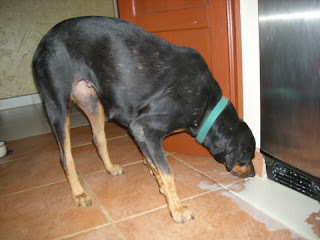 Do you know what a dog does when she gorges herself on three cups of cream? Of course: she throws up. 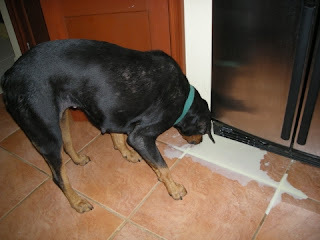 Do you know what a dog does when she vomits sweet and tasty cream and egg mixture? Of course: she eats it again. Honduras recently passed a law that allows children to attend school even if they don't have a birth certificate. Of course it makes sense that birth certificates are required, but this is Honduras! Sometimes getting a birth certificate is impossible. Lots of children are not born in a hospital. Lots of fathers disappear. Mothers sometimes cannot travel to wherever they need to go to get one or don't have the documents or the money that they need to get it. Maybe I'm being cynical, but I'm betting that that the law change was based on pressure from the World Bank or some other international aid association. The World Bank puts a lot of emphasis on education as being one of the keys for a reduction in poverty. When children are completely denied that right just because someone didn't or couldn't get that important piece of paper, that is just wrong. El Jefe, also being cynical, says that he is sure that some relative of one of the diputados (congressmen) or some other important person must have had a birth certificate problem, so they passed the law. Whatever the reason, it was a bittersweet moment for me. I couldn't help thinking about the two children that I know who were not allowed to go to school. And since I don't know all that many children, it makes me wonder how many others have been doomed to extreme poverty because of the prior law. In one case the parents were dead (the father was murdered and the mother died of AIDS). For whatever reason, they had never gotten his birth certificate and his grandparents weren't able to provide the proof needed. 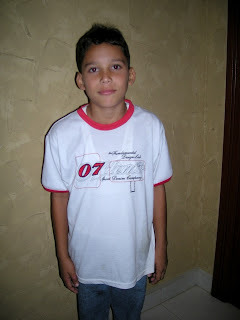 He was 8 or 9 when I first met him and had never been to school. Now at 14 or so, he will never go and has already been involved in some petty crimes. Nora's oldest son, Jounger, in the photos, had a birth certificate with a typo. The certificate gave his birth date as 5 years later than it actually was. He was denied entry to school by the asinine bureaucrats, even though it was obvious that he was old enough to go. Nora tried to get the birth certificate corrected, even spending food money to take a bus trip to the city where it was issued. No one would do anything to help. Rules are rules and documents, no matter how erroneous, are inviolable! To show the powerlessness of the poor, there was nothing Nora could do to right this ridiculously wrong situation. Someone had made a stupid mistake and was not about to admit it. No one else had the power or common sense to correct it. Every year when school started, she would try to get Jounger in, pointing to his height and saying that the birth certificate was wrong and every year she would be told that rules are rules! Imagine in your country what a scandal it would be if a mother went to the media with this story of extreme bureaucratic nonsense! What a field day they would have exposing the stupidity of the government bureaucrats. The same thing happens here with the ID cards that everyone must get when they turn 18. If someone types your name wrong, you might as well change your name, because the card will NEVER be corrected unless you have a friend in the bureaucracy. 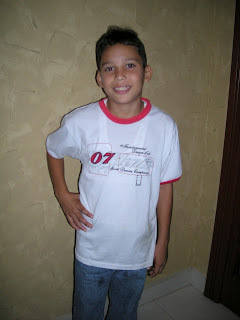 So, Jounger started first grade at somewhere around 10 years old. He HATED it! The younger children teased him because he was at least a head taller than all of his classmates. The older kids teased him about being a dummy. He would get upset, leave school, and come home. Carlos, his step-father, started taking him to school, but as soon as Carlos left, Jounger would turn around and go home. Carlos said that Jounger cried all the time and told Carlos that he would rather be beaten for disobeying than go to school. (I'm tearing up here.) Carlos cannot read or write so he understands the importance of school and kept stressing that to the boy. He stuck to his guns about Jounger attending school. Because of his and Nora's perseverance, Jounger has since done well. Nora mentioned that his teacher said that he may even be eligible for a scholarship next year. I don't know exactly what that means because public schools are supposedly free in Honduras. Maybe a scholarship pays for supplies or uniforms, I'm not sure. Whatever help it is, this is definitely a family that needs it. There are lots of children in Honduras who don't go to school because their parents cannot afford pencils and notebooks for all or sometimes any of their children. I know that sounds incredible, but it is true. The day of our party, Jounger came with Nora and spent a happy day watching cartoons on television. When I asked him about school, he enthusiastically said that he likes it now and he proudly told me that he had passed second grade. I'm hopeful that he will overcome this horrid start to his education. Trying to look at the bright side, maybe his maturity over the other students has helped him. I just hope that Honduras doesn't have another law that will kick him out of school 5 years before he's finished. Isn't he just the cutest little boy you've ever seen? And he is as sweet, polite and respectful as he is cute. He deserved a chance. La Gringa: Do you want me to make you some tea? LG: I forgot the name of this in Spanish. LG: Oh, yeah. . . . Uh, I forgot the name in English, too. Everything I've read about chamomile tea says that the tea is made from the dried flowers. 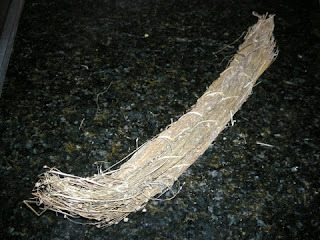 This is a photo of the chamomile that is sold here. As you can see, it is primarily stems. But everyone seems to think it works anyway. 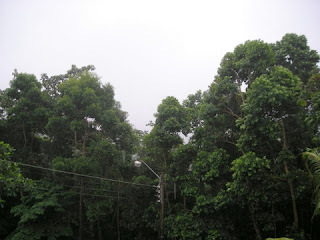 There is supposed to be a mountain in that 'vee' formed by the trees. That mountain is our weather predictor. When it starts to disappear, we know that we are going to have rain. We can even get an idea of how long it will be before the rain. I don't know what we'll do when the trees grow and cover our view as they have done with most of the rest of the mountains behind our property. 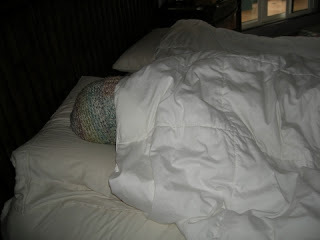 Yesterday and today have been so cold that we didn't even open the windows. 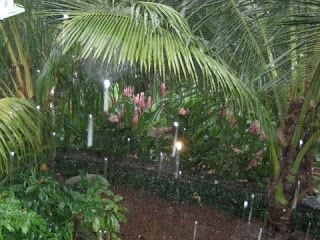 Last night the news reported that the temperature in La Ceiba was 21°C (69°F). 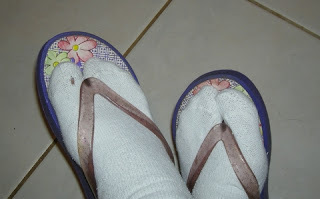 I can also tell that we've had more 'cold' weather than usual this rainy season as I'm starting to get a hole in my sock. 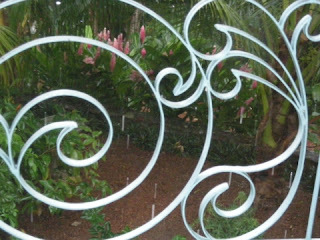 Yesterday I noticed how pretty the pink ginger looked framed by the coconut palms. I took this picture and got this interesting result. It looks like there are glowing candles floating in the air outside. I guess it was the reflection of the rain drops. Blogger now allows commenters to use their OpenIDs to leave comments. Blogger explains it better than I can, but from what I understand, it will now accept your existing OpenID's from WordPress, LiveJournal, or AOL to name a few. Bloggers, note that you may need to change your blog's settings to accept them. Commenters can continue to use a Google ID to comment or read more about OpenID and set up your own OpenID. The advantage of using an Open ID is that it can be used on other blogging platforms and websites, and it can be linked back to your blog or website. The goal of OpenId is to be able to have one secure ID and one password that works at millions of websites without having to enter your email, birth date, and all that other information asked for when registering at a new site. Wouldn't that be great? I hope it catches on. Before going to get the washing machine repairman, El Jefe was at his brother's house borrowing his car. Well, needless to say the whole family started rolling on the floor laughing picturing La Gringa washing clothes in the river. Haha. His mother said "How are you going to do that?" (as in: you can lead a horse to the river, but you can't make them wash.) Haha. They took turns imagining me down there standing in the river washing my clothes. Haha. 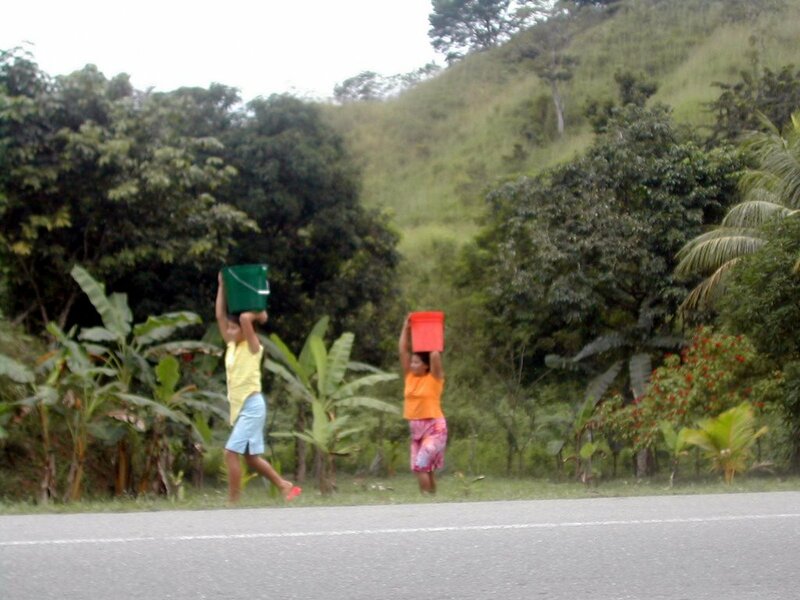 His brother said that El Jefe would have to get me a 5-gallon bucket to balance on my head when carrying the laundry. Haha. His sister-in-law pictured me arranging the wet clothes on the gravel and waiting all day for it to dry. Haha. I told him that the worst that I imagined was carrying our laundry baskets a half a mile down the road to the highway and waiting beside the road for a taxi to come by. That would be bad enough. I can't imagine what our neighbors would think. Another reason that I could laugh is that both of the women now have their own washing machines and were pretty disappointed that both machines were broken. It is hard − for anyone − to go back to the old ways once you have experienced modern conveniences. Haha. Do you see those red lights glowing?! La Gringa is happy today! El Jefe's mother recommended a repairman, technically not the Maytag repairman, but supposedly a good one. I was leery but El Jefe said that he had had a lot of training, even having been to Tegucigalpa for some special training. As it was getting difficult to even walk through the laundry room by this point, he borrowed a car and drove to El Porvenir to pick up the guy. Why was I leery? Based on a long line of experiences of which I'll tell you a few. Once we had our car in a shop in San Pedro (highly recommended by a friend) for three months, bought $300 of parts, and after numerous phone calls and trips to San Pedro, finally had to take it back in exactly the same shape it was in to start with. El Jefe's old car spent most of one year in the shop trying to repair an oil leak that required pulling the engine out of the car. Generally, when it begins to look hopeless, we take back whatever is being repaired and take it somewhere else. You can't do that when your car has no engine installed! It took us almost two months to find a bolt that the mechanic had broken while removing it. The repairman, friend of a friend who was recommended to us, wanted to charge more because it was basically his career for that year. Guess what? When we got the car back, it was still leaking oil. Currently we are going on six months without a car. After numerous and expensive car part purchases from the states (one by one, and often sending them back and forth because they were the wrong ones), and all this time, the mechanic (highly recommended as the best transmission mechanic in La Ceiba) finished yesterday and guess what? It's the same. Absolutely no change. One repairman had one of our ceiling fans for about six weeks. Convinced that a certain part was no good, he had a new one rebuilt. It was rebuilt wrongly, didn't fix the problem, but to top that off, he threw away the original part so we don't even know what the part is supposed to look like and can't get another one made. When we had our lawn mower repaired, for absolutely no reason that we can discern, they welded the height adjustments on all the wheels to the lowest level and we had to take it back to get them to "unweld" it. The speed selection on my electric mixer quit working. The repairman took off some parts, lost them, and then returned the mixer to us a month later, still broken. My neighbor had one of his car parts replaced with a pop top from a coke can and was assured that it would work just as well. I'm sure we would never have noticed the switch, but this neighbor did. So, that's the reason why we try to repair the things that we can ourselves, when humanly possible. The most frustrating thing is that no one will ever tell you that they can not fix something. They will just keep it forever! You can call and/or visit them and each time you will be assured that it will be ready mañana, but it never is. But, this repairman was different! At least this time was different. He found the problem! Needless to say, based on experience, whenever we need a repairman, I just get sick to my stomach worrying that they will cause more problems than they solve or waste our time and money having us buy parts that we don't need. 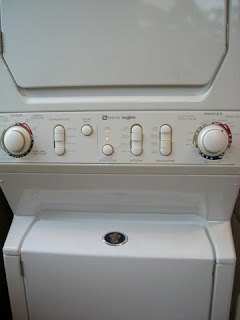 I was a little more resigned this time, trying to accept the fact that the washer is seven years old and if we just had to buy a new one, so be it, even though I think that they should last longer than that. I was afraid that he would say that we needed part A from the US and after getting part A, he would say we needed part B, then part C, and so on and so on. I guided him through the trouble shooting chart from the repair manual, but honestly, he seemed to know where to start and one by one, he found that the most likely suspects were all functioning. Finally, out of ideas from the manual and my stomach hurting so badly, I had to go away. About 45 minutes later, El Jefe came to me with a big smile. "No!" I exclaimed. "You aren't going to tell me that he fixed it without buying any parts?" Yes! 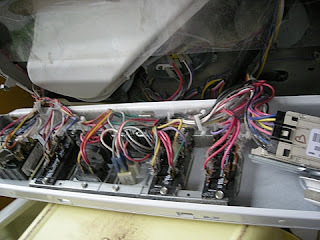 Deep in the bowels of the dryer compartment, the electrical wiring from the dryer to the washer was burned and crumbled. He cut off the damaged parts of the wires and reconnected them. The repairman said it was due to the dryer overheating (which it has done for years). I don't know if that could cause it but he fixed it so I'm happy. By the way, he charged L.300 (about US $15). It was late on a Saturday night by then, so he said he would have to come back another day to look at the dryer overheating problem. At least I can now get this mountain of laundry done. Spotted at Paiz grocery store in La Ceiba. Must we contaminate the entire world with garbage like this? Coca cola: fine! McDonald's: why not? 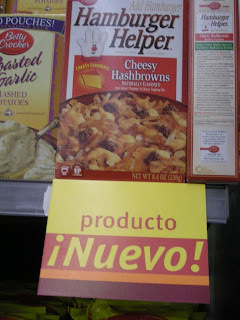 But Hamburger Helper? No wonder people think we don't know how to cook. The Blogicito is up to 569 articles now and I'm thinking that I need to reclassify some of my articles to more specific topics (labels, keywords, whatever you want to call them). I imagine that most of you come here to read about "Life in Honduras," but at 75 articles, only the most dedicated or desperate people make it through all of the articles in that topic. Then there are 64 articles under the topic "Only in Honduras" of which the distinction has become blurred even in my mind. I rarely look for articles by topic myself. Usually if I need to refer to an old article, I use the search feature because I know some specific word that was used in the article. I consider the topic function to be more of a benefit to the reader. So I'm asking for your help. If you use the topics to search for articles of interest to you, or did when you first stumbled upon the Blogicito, what other topics would be/would have been helpful to you to find what you were looking for? I don't like having an excess of classifications or applying multiple labels to the same articles, but I'm open to your suggestions.